In what the local media is calling “a bizarre coincidence,” police arrested a fired Oklahoma City nursing home worker on Friday after he allegedly threatened to cut off a co-worker’s head. 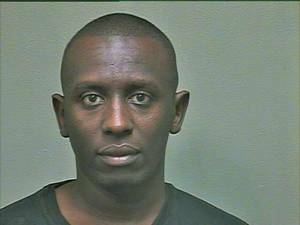 Muriithi, a native of Kenya, worked at Bellevue Nursing Home in northwest Oklahoma City, according to police. His arrest Friday coincided with the revelation that fired Vaughan Foods worker Alton Alexander Nolen/Jah’Keem Yisrael had beheaded a co-worker after he was fired the day before. The co-worker, who has not been identified, accused Muriithi of threatening her while they were both working at the nursing home on Sept. 19, according to the arrest warrant affidavit. Last week, a senior ISIS leader called for attacks in the United States and on Western allies. “The victim said Jacob asked her what time she got off work and she replied by asking him in a joking manner if he was going to kill her,’ the detective wrote. “Jacob told the victim, ‘Yes,’ he was going to cut her head off. The victim asked Jacob what he was going to cut her head off with and he said, ‘A blade,’ then told her after he did it he was going to post it on Facebook. Reportedly, Muriithi repeated the threat towards the co-worker in front of another employee, allegedly saying that he was going to use a blade. It will be interesting to find out if Muriithi attended the same mosque, the Islamic Society of Greater Oklahoma City, that beheading suspect Alton Nolen/Jah’Keem Yisrael attended.